Whoever coined the phrase "dirt cheap" never gardened in raised beds. While I budgeted for lumber, screws, and seeds, I didn't factor the cost of so much soil. The official Square Foot Gardening additives--peat moss and vermiculite--would require a trip to a nursery and the purchase of additional compost. I found a frugal alternative in Lasagna Gardening. Starting from the grass up, we layered newspaper, chopped dried leaves, peat moss, grass clippings, and compost. Over time, this will break down into prime, rich soil. To compensate for this year's oops, we added an additional layer of Miracle Gro Organic Soil (a Big Lots bargain at 2 cubic yards for $8). If we had a truck, we could have picked up the city's compost for much less. Mother Earth News' handy conversion chart helps you compare bulk vs. bagged prices. That is so true! I could hardly believe last year after we built our two small garden boxes that it cost $100 to fill them with dirt. On the upside, everything grew really well! Great alternatives to that costly SFG mix! I'm not gardening this year (a baby due in July doesn't mix well with garden plans!) but I'll be keeping this in mind for next year. You don't need a truck to use the city's compost, but rather a pot of containers/bags and a tarp for your trunk (to catch any spills). We did that a couple years ago, returning to the compost site as needed for more dirt. This cost of dirt is even true when one starts seedlings. I am convinced that buying the plants is just as cheap as buying all the soil for the seeds, especially on the huge scale that I garden. We do indeed go to the city for the garden soil and compost but going to the city for little 4in pots of dirt just seems ridiculous...well.. that is until I spent about 80 bucks on soil this year. If we didn't live 30 minutes from the mulch facility, we would have tried that in the station wagon. Since I only needed about 3 of these big bags, the neighborhood Big Lots worked for us. I love my mulching mower - I mowed over last fall's pile of leaves and it ground it up into tiny leaf bits. I bet that would make a great layer in a "lasagna" garden or even help it if you added it to a compost pile. I certainly appreciate your enthusiasm and love for planting tho' - although I may not share in it! I hope it works out for you Meredith. Least year I used Big Lots dirt for all my plants in containers. They all died. It was so bizarre because I paid the big bucks for fancy nursery plants that should have thrived. All we could think of was that the dirt was somehow bad. So far this year everything is growing well. I'm just using cheap hardware topsoil (on the recommendation of my gardening neighbors). I think that you came up with a great solution. We upgraded this year from 2 raised beds to 9--that was an enormous amount of dirt. We have a Suburban, and I lost count of the number of trips it took. On the upside, my husband is thrilled with his new hobby, and has a true diversion to thinking about work. One that can be shared with kids. So, worth any cost. We have been reading about lasagna gardening too--it sounds like something that would work for us (we hate digging). Oh man. I won't even say how much spent on my "frugal" SFG attempt this year. Even after all the hassle the mix settled down and needs to be refilled. I don't think I have enough compost to do it. I will have to check out Big Lots for some of that soil. Sigh. Yes, growing your own food can get expensive! And that lasagna gardening idea is a good one -- you don't have to make it perfect the way she shows you in her pictures and drawings -- just chuck the stuff in there. We're going to give raised bed gardening a try this year with our seedlings. Instead of buying or building beds, we're going to use an old bookcase. It's the perfect size for a small bed and since it was one of my husband's curbside treasure finds, it was free! Yes, I spent a fortune on dirt. I wanted to do lasagna gardening, but as we had just moved into our house had no leaves, no grass clippings (grass is growing slowly here) and not even newspaper. So I just bought all the dirt from Walmart. I probably spent $70 on dirt for one 4x8 bed. I really hope I get some good veggies out of this experiment. This fall I'm totally setting up the lasagna garden. We were planning to do that this year. When I talked to a girlfriend and she shared that they spent $150 to fill their raised bed, I started doing the math in my head for how much that little garden would have to pay off. I love the idea of a raised bed, but am still on the fence if it is a sound investment over what I have been doing. I love your thrifty solution though- we have plenty of dead stuff laying around to layer up that bed. Fantastic frugal idea!! Isn't that the truth. I couldn't believe how much dirt was when we went to buy it for some raised beds. Our "raised beds," without the lumber started out as truckloads of free leaf compost from our local transfer station, where the garbage trucks bring the trash. I think it took about 10 loads to create the vegetable garden. In fact, all of the perennial and vegetable beds in my yard had their beginnings with the leaf compost. Wonderful stuff! We no longer have the truck (too expensive! ), but I'm using my minivan to haul the leaf compost to add to the vegetable beds this year. I have a large green container and a trash can in the back, and about 8 5-gallon buckets in the main part. I did have to take a seat out, but it's where my ds13 sits. We have three compost bins and compost just about everything. The only ingredient that's in short supply are the brown leaves. We get those in the fall when they blow into the yard. My alternative to garden boxes was a garden oval !!! I purchased plastic edging for $4.oo , a roll of garden fabric $5.00 ,(4 bags) garden soil $4.00 a bag , and a new soaker hose $8.oo . I laid out the garden fabric , looped the plastic edging around it , poured dirt in , raked dirt into a row , planted my tomato , squash, pepper and thornless blackberry plants. I then lay the soaker hose over and around my little garden . The blackberry plant is thriving , we've had a lot of rain and the tomatoes are too wet . We'll see how it goes . I will add more dirt and edging each season until I have a " proper " garden. I needed something that was both free and didn't involve driving around or a lot of work. What I did was last fall was set down broken-down cardboard boxes (from trash/Aldi's/neighbor's recycle bins) where I wanted beds. Then I dug trenches between the beds, putting the dirt on top of the boxes. I topped it with anything I could find in the leaves/grass line. I'm working on a compost bin, but didn't have anything made yet last year. It is not nearly as "neat" as raised beds with purchased soil, and I do have to weed. (I'm putting more cardboard down between established plants, though). But it seems to be growing the plants fine so far. My sister suggested lining the trenches with rocks so it's not so mucky to work in the garden during early spring, but that would involve money and time in the car, neither of which I have. The book, *Food not Lawns* had a lot of great ideas on working with what you have to grow what you can. I just got home from Home Depot and buying tomato & cucumber plants and flowers, and they had that same size bag of Miracle Grow Organic dirt for $6.97! I thought that was a great price, and I guess it was, since it beats even Big Lots prices. Walmart sells a SMALLER bag that's 1/4 the size of this one for $4.5o. It's very easy to get confused between bags labeled cubic feet and bags labeled cubic yards. I have a feeling that's not accidental! It makes comparing prices much harder. Queen of Carrots--I wish you'd write more about frugality because I'd love to learn from you. I get the method now. With the trenches, you create a reverse raised bed by digging out around them rather than building up around the ground. smart! Look forward to checking out that book. I made my raised bed by using old cinderblocks that were out in the yard when we moved here. It made a nice little garden area. I used the holes in the blocks to plant onion sets. I found a great deal on soil at my local Ace Hardware. 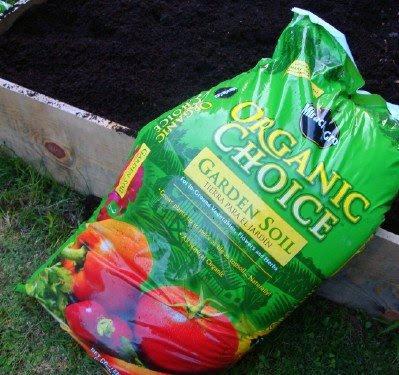 40# bags of Organic manure/humus mix for 1.50 each. I had that exact same thought after my dad built me three 4x4 boxes and I tried to find vermiculite all over town. I'm sure as heck not gonna pay $6/bag for those tiny little bags. I went to a nursery and asked for some. The guy said, "you doing square foot gardening?" He then proceeded to tell me we didn't really need the vermiculite. I felt much better. But here's my big oops. Our city gives away "compost" for free so I went over and got a bunch while my dad was here with his truck. I've never done this before - I mixed all that in with my peat moss and somehow came to realize it wasn't so much compost as it was probably mulch. I'm not sure what I'm gonna get, but I do have sprouts coming up. We'll see. I'm definitely going to figure out the compost thing for next year! Oh, and of my three boxes, I only have two filled. There is absolutely nothing cheap about dirt. Hi, I just found your site from CFO today. This is so true about dirt. We bought some organic soil and organic manure mix and just to fill our little 4x4 square foot garden was $60! Granted it's all organic and 'should' grow the plants well, but man! Well, hopefully will all the tomato plants I have all over my yard and in the SFG, I will get some of that back! We are starting our first "real" garden this year. I am enjoying reading all these comments and gleaning the advice of more experienced gardeners. We can pick up dirt at the transfer station for free. One truck load per day so hubby was busy loading and unloading the dirt. In 2 more weeks, we can transfer out plants from the pots to the ground - can't wait. Hey!! Nashvillians, where do we pick up "city compost?" At the Omohundro recycling site, or elsewhere? Tell me, do. One of the best things we ever bought was a utility trailer to haul behind our van. Our local feed store has a garden centre in spring that sells topsoil and mulch by the bobcat scoop - it's WAY cheaper than buying bags. Another option - find someone with a hobby farm or horses. We found a friend with a "poop mountain" of lovely rotten horse manure broken down into black loam. She was eager to let us take as much as we wanted for free! What a terrific idea (the "Lasagna Gardening")! I have two really oddly-shaped pieces of dirt in my front yard that are always a pain to landscape, and wind up running to weeds. This sounds like it just might work, since there's no requirement that it be any particular size or shape! Thanks for the great ideas! I have two raised beds...4' by 8' by 18" each. We bought really good soil..too much really. I was out of town and my husband and another person hauled it all back there. He and the other guy stomped on the soil to compact it. That wasn't good, eh? The tomatoes are doing well (zone 9b here) but my cukes are barely growing, same with yellow squash and bell peppers..oh and beans. Anyone know what I should do? We are composting but it isn't quite ready yet..my first year doing that. The cukes were from seeds..as were some of the tomatoes...oh and beans from seeds. They all began to grow..and I got one squash..and now nothing. It's dormant. Planted in May..soil was 65 degrees. The radishes did just fine. My bok choy went to seed, and my fennel got tall but that was it. I realize this post is from last year but we are just now building our raised beds for our garden. We built two today. I am putting them next to the house in the flower beds so I can have salad stuff close to the house. Anyway, we live in the country and have friends who have cows. When he cleans his corrall he just puts it in his trailer and either he or we haul it to our place and we shovel it out into our beds. Its free. Try asking rancher friends for free manure dirt what ever. ps I posted pix on my blog of our one of our new raised beds. I've been so neglectful with reading blogs. Really neglectful. As I was catching up on posts I saw your link to this one from last year. We too are building raised beds in our front yard to create an edible garden. Living in CA, the weather is so hot, that I'd rather water knowing I'm producing fruits and veggies than spending $100s on keeping the grass green. We are doing the Lasagna Layering too. I just wished I had made smaller (in height beds). We are saving all our cardboard to layer first (punching holes in for easy drainage and worms), paper (that I've asked for off Freecycle), our scraps of food and coffee grounds (from the coffee shop..I have 40lbs outside to put in our next bed), straw and chicken manure from a local farm. However, the peat moss is so VERY expensive!!! I try to save it for the top layer to reduce costs. Once finished we cover it and staple to the wood. P.U. you can tell it is working and the heat being produced. My children enjoy helping me. I look forward to anymore posts that you will have! Thanks!